JungleWatch: ALTAR OF SECRETS...THANK YOU, ROSE. ALTAR OF SECRETS...THANK YOU, ROSE. 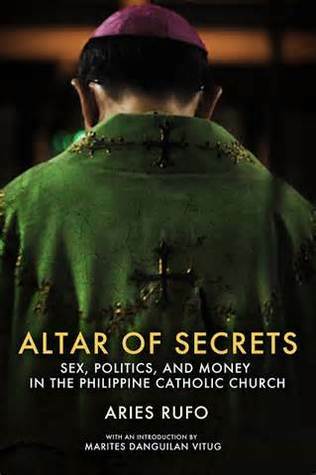 In his book, “Altar of Secrets” (2013), former "Manila Times" and "Newsbreak Magazine" journalist, Aries C. Rufo who, for many years in his career was assigned to the religion beat of the Manila Times, chronicles among other things, the unpunished sexual misconduct and financial mismanagement of the Philippines’ bishops and priests. Mr. Rufo writes that there is some degree of acceptance in certain sectors of Philippines society of priests fathering children that this condition seems to have lost its shock value. The Archdiocese of Manila even has an allocation for financial support to children fathered by members of the clergy. He didn’t identify it by name to maintain the privacy of the children, but he writes about a gated orphanage in Manila run by nuns. Some of the children in that orphanage are children fathered by Catholic priests. In 2012 when he pressed the nun in charge of that orphanage to confirm this report, the nun replied that it was not the issue for the orphanage, “The issue is to give these children a decent future.” Her response skirted the issue. “Altar of Secrets” (“Altar”) covers in detail the sexual misconduct of Bishops Crisostomo Yalung and Teodoro Bacani --- proteges of the late Manila Cardinal Jaime Sin; both former auxiliary bishops of Manila; both educators and administrators of San Carlos Seminary. Bishop Yalung was a most-sought-after inspirational speaker, a media personality and a public figure largely active in political affairs. Bishop Bacani was an active member of the Parish Pastoral Council for Responsible Voting. In the span of one year (2002 and 2003), Cardinal Sin lost these of his most favored bishops to successive scandals: Bishop Yalung for fathering two children and Bishop Bacani for “an inappropriate display of affection” to his former secretary. 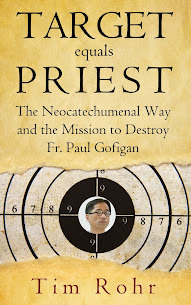 To drive the point that, while the Church involves itself into every aspect of Filipino life, but has resisted outside attempts to poke into its internal affairs, Mr. Rufo writes of rumors and anonymous letters about Bishops Yalung’s and Bacani’s supposed affairs sent to the Roman Catholic Archdiocese of Manila (“RCAM”) and the Catholic Bishops’ Conference of the Philippines, yet no internal investigation transpired. Rather, the Church handled the reports with a conspiracy of silence on the pretext of an internal Church investigation (i.e. ‘we can’t comment on an on-going investigation’ when there was no investigation initiated). The response of the Church was to continue to place its blind trust on its erring clergy amid the mounting evidence and calls by lay leaders for an immediate investigation. The Church was concerned in protecting the privacy of its erring clergy; was quick to condemn the women as guilty; and also fast to absolve its erring clergy. In this scenario, Mr. Rufo observes that the Church is quick to demand loyalty and accountability from the laity, but was unfaithful to its own preachings. Other than the two examples written of above in a compressed and general overview, there are several specific examples of illicit relationships by clergy written about in "Altar". You’ll have to read the book for the details. So as not to leave you wondering about the bishops cited above, in the end, as to Bishop Bacani, under the threat of his former secretary filing a case in a Philippines civil court, admitted to lapse in judgment and was forced to resign in 2003. Bishop Yalung resigned in 2002. Under the advice of his superiors he fled to the U.S. a la Abp. Apuron “for some soul searching.” Following his resignation, he responded broadly to journalists’ inquiries by admitting he had “committed quite a few mistakes, some administrative, others personal or relational.” He fled to Sacramento, CA, bought a 6-bedroom house where he lives with his parents. He then obtained a master’s degree in social work from California State University. He now goes by the name Tom Yalung and appears to have put the past behind him and resumed a normal life. My point to contributing this my comment above is to express my gratitude for the work of the “Spotlight” team on clergy sexual abuse and on its newest report on illicit relationships by clergy in the U.S., some of which resulted in, in effect, fatherless children. I’m grateful also for Mr. Rufo’s work in "Altar" chronicling the same subject matters in the Philippines Catholic Church. Tim Rohr's work for maintaining JungleWatch and Mr. Rufo for writing "Altar" are demonstrations of their natures in being steadfast in Catholic faith yet ache for and are hopeful in its reforms. I’m almost certain both believe that reporting on the failings and frailties of some of its clergy and some of its systems, their local Church would eventually be strengthened. Like them, I pray for the same. Clearly, just as those who punish faults are worthy of blessing, so those who coddle sinners are subject to a curse, as the prophet says: “Cursed be he that withholdeth his sword from blood. Indeed, he who withholds his sword from blood is he who restrains himself from imposing the punishment of a proper sentence against evildoers. “Those who fail to correct are themselves guilty of the act.” If, therefore, Eli, only because of two sons whom he did not correct with a proper punishment, perished together with them and with such a great multitude of men, of what sentence do we think them to be worthy who preside in the palaces of the Church and in the seats of judgment, and who are silent in the face of the known offenses of depraved men?" ― from "The Book of Gomorrah and St. Peter Damian's Struggle Against Ecclesiastical Corruption"
The Catholic Priests, and their unknown shocking stories keeps building up. It sadness me after all these times I've listen to them preach on the altar which most times I find comforted and to learn that as soon as they step off the altar they are totally FAKE? I don't buy it, but for some the famous lines would be used after the fact to cover up "We're only humans, Weak, and a Sinner". YOU MAKE YOURSELF Humanless, WEAK and a Sinner? Don't we have the Ten Commandment!? Excuse me, I need to go vomit. The thought of Judas priests' filthy hands confecting the Sacred Species makes me sick. I know married couples who were horribly traumatized when they found out that priests who officiated at their weddings and baptized their babies are pedophiles. They felt that the Sacraments were invalid and they were never married. It took a lot of pastoral counseling to convince them that wasn't true. Some of them left the Church anyway. 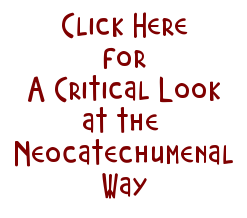 This mortally sinful behavior has been escalating for centuries and nothing will stop it now. Nowadays most people don't care what goes on between consenting adults, whether clergy or laity, gay or straight. There's even a horrifying increase in approval of polygamy in the US.